Boost your travel offering with real and authentic user-generated social content your customers trust. Now more than ever, travelers are creating and sharing beautiful pictures and videos of their journey on social media. Use this content to bring the travel experience you offer to life. Because real and authentic - that's what your customers trust. Crowdynews' social media curation platform easily finds and publishes the best social content that's directly related to your offering. And you can drive engagement and conversions like you've never seen before. 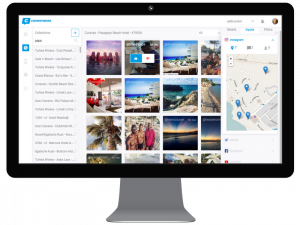 Automatically gather images, videos, and other social content shared by travelers all over the world. Geo-located to your destination, property, or experience. Use built-in algorithms and human moderation to discover the best content that supercharges your story. White- and blacklist content and/or users to keep your content safe. Automatically or manually select the content you are looking for to drive real-life and real-time word-to-mouth recommendations and engagement. Keep users onsite longer with integrated drill-down scrolling. Filters, built-in profanity blocking, and white- and blacklisting help you only select the most relevant and safe posts. Manual moderation lets you further refine which posts should be included or excluded. Use different sources to surface the content that benefits you - such as Adwords keywords, geo-targeting, and more. AI-driven auto-moderation learns from your manual moderations and automatically curates future posts based on your input. Scanning a myriad of social networks continuously, while supporting more than 25 languages, the Crowdynew platform can bring value to travel brands all over the world. 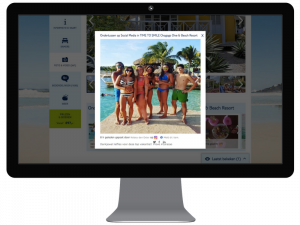 Adding traveler-generated social content to our resort pages increased conversion and reduced bounce rates. And it gave our visitors more reasons to engage with the page and stay onsite longer. Ready to See it Live in Action?